A leading author on Sri Lanka’s efforts to repair relations with the Tamils. Professor Rajiva Wijesinha is a distinguished Sri Lankan writer, who is known for his political analysis and creative and critical work. 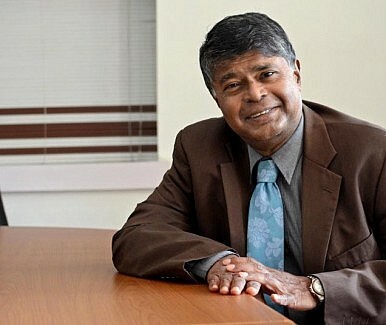 In 2007, former Sri Lankan president Mahinda Rajapaksa appointed him secretary-general of the Sri Lankan government secretariat for coordinating the peace process. In 2008, Wijesinha became secretary to the ministry of disaster management and human rights. Wijesinha has written for numerous outlets and recently spoke with The Diplomat’s Muhammad Akbar Notezai about Tamil nationalism, Sri Lanka-India relations, the militarization of Sri Lanka, and the fall of former president Mahinda Rajapaksa. What is the Tamil nationalism or the Tamil national question in Sri Lanka? Tamil nationalism in Sri Lanka has essentially two components. One is the feeling that, given deprivation over the years, Tamils should have a nation state of their own. The second is the theoretical notion that people with salient differences – racial or religious or linguistic – should belong to separate countries. The British I fear encouraged this idea of nationalism when they encouraged the creation of Pakistan, when there was no evidence of discrimination. Conversely, they completely ignored the idea elsewhere in their colonies, which is why I believe they decided on Partition in their own interests. What are the major political and economic issues for the Tamils? Firstly, Sri Lanka had a ridiculous language policy whereby Sinhalese became the only Official Language, whereas there were no effective measures to teach Tamil children Sinhalese. Students were stuck in monolingualism, with Sinhalese not required to learn Tamil nor Tamils Sinhalese. And neither had to know a second language, i.e. English, which meant they could not communicate with each other – although the children of the elite who instituted this policy did have English knowledge. Secondly, development was for the most part confined to the West coast, which is why indeed we had two Sinhalese rural youth insurrections in addition to the Tamil one. But from the Tamil perspective the fact that successive governments neglected their areas was reason enough to believe that those areas would do better on their own. Both these issues have been addressed in the last few decades, but not swiftly or effectively enough, and there is much greater need to ensure greater input into governance for the Tamil areas. What are your thoughts on the Tamil conflict and human rights violations committed by both sides? The LTTE was a brutal terrorist movement and felt no compunction about violating the rights of the Tamil people, let alone Sinhalese and Muslims. Muslims were expelled from the Northern Province in 1990 in an act of ethnic cleansing which prejudiced Western commentators tried to imply was a charge that could be placed against the Sri Lankan state. But in fact there was comparatively little violation of rights by the Sri Lankan government, except for government encouraged attacks on Tamils in 1983, which is what led to much greater international support for the Tamils. We fought a comparatively clean war, certainly a much better one than those engaged in by countries which criticize us such as the United States. But there were individual violations, as noted in our own Commissions of Inquiry, and these should have been dealt with expeditiously, which did not happen. What was India’s involvement in the Tamil conflict? During the eighties the Indians engaged in active support for terrorist groups, which was wrong but we have to understand that those were Cold War days during which India felt that terrorists in India were being supported by Pakistan with the connivance of the West – and also by the Afghan extremists the West supported. This was understandable suspicion, given for instance the Kashmiris who died when the U.S. reacted with bombing raids to the attack on the USS Cole. And this was the period when President J. R. Jayawardene was trying to get involved in the Cold War on the American side, offering them military and broadcasting facilities. But after we promised to avoid such adventurism in the future, through the appendices to the Indo-Lankan Accord in 1987, India provided us with support against the LTTE, and helped us in the final battles amongst some politicians in Tamilnadu. What was the level of Indian support for the Tamil rebels? They trained them, and provided them with weapons and financial support. But I should note that this was also done by the Israeli government, even while it was training our forces – this is revealed by a former Mossad Agent, and is evidence of something we all need to be careful of, which is that even those who seem to be our friends feel that unstable situations give them more scope for deriving benefits for themselves. This is something I think you have learned to your cost in Pakistan, and which the Indians need to be aware of as they contemplate adjustments in their traditional foreign policy. How do you view India-Sri Lanka relationship, especially related to the issue of Tamils? The relationship was good after 1987 but turned sour in the last few years of the last government, largely because Rajapaksa, after we won the war, did not take a few simple measures, as he had promised the Indians, to promote reconciliation and to initiate a political solution that gave more power to the Tamils. He failed too to assuage Indian concerns about our relations with the Chinese, which was silly because the Chinese, unlike for instance the Americans in the Cold War days, did not want an exclusive friendship. Obviously there is some rivalry, but we have nothing for which any country needs exclusive rights, and we should have made this clear. But we failed to do this, and allowed for propaganda that we were in the Chinese camp against the Indians – with the West for instance alleging that the Hambantota Harbour was part of the Chinese String of Pearls strategy, whereas we had in fact first asked the Indians to help us to develop it. It was only because they turned down our request that we asked the Chinese. Later someone in the Indian High Commission told us he felt they had made a mistake, but we have to understand the decision making and financial constraints they suffer from, whereas the Chinese are able to respond quickly. What is the bone of contention between Sinhalese and Tamils? And how has it been exploited? Excessive central control of functions such as education which are more effectively exercised locally. This can easily be changed through greater empowerment of local government bodies, whereas we are now stuck in arguments about whether central or provincial governments should control matters. These are political wrangles whereas development is better promoted by decisions being made by the third tier of government about most matters affecting the day-to-day lives of people – as indeed India discovered in the nineties, with its Panchayats, which is why I cannot understand some Tamil politicians still hankering after provincial powers, when they should target responsiveness to people. Despite overseeing the end of the separatist war by Tamil rebels in 2009, why did Rajapaksa lose the power? Though he did a lot for infrastructural development in Tamil areas, more than any other Sri Lankan government had done, Rajapaksa did not ensure consultation or political involvement by Tamil representatives, which effectively alienated the Tamils. Then he failed to quell a group which led attacks on Muslims, even though he agreed with me that this was unacceptable, and indeed alleged that the group was supported by Western nations to undermine him. If he believed this, he should certainly have acted, but he lost all Muslim support. In addition he, or rather his brother Basil to whom he had entrusted development activities, alienated some people even within his party by bypassing able politicians – such as the present president, or the former chief minister of the large province nearest the Tamil and Muslim majority areas – in favor of stooges who were not effective. And he forgot about many changes he had promised in his 2010 manifesto, relying only on prestige from the war victory. Though the country at large is still grateful to him for ridding us of the terrorism that had led to so much suffering and a state of permanent tension for decades, you cannot sell the same success over and over again, and people were getting tired of the failure to move forward more effectively. What does the Sinhalese military’s strong presence in Tamil-dominated areas mean? Could it result in problems in the near future? The presence of the military in itself would not have been a problem, because it is understandable that we need to be hyper-careful about a resurgence of terrorism. Though I think the LTTE as an organization was destroyed within Sri Lanka, there are still former cadres who could be tempted back, not least because we did not do enough about reintegration. And there are still members of the diaspora who hanker after separatism and have a history of supporting terrorism to achieve this. Sadly some Western countries, in particular the United States and Britain, continue to encourage these groups, often for electoral reasons as David Miliband confessed to the Americans according to Wikileaks. But government also erred in two areas, the first being allowing the military to interfere too much with governmental activities. Given the expertise of the military in several fields, its input would have been invaluable, but this should have been through civilian mechanisms, working under the duly elected local government bodies. They could for instance have done much more with regard to training, which is inadequate in the North, but the secretary of Defence told me, when I prepared a paper about this, based in part on the excellent work the army in Pakistan does with regard to education, that he did not want to be blamed further. He did not work on the suggestion I had made that training be done through civilian bodies, which would have been a simple matter to set up. Second, the government kept too much land in the North, claiming this was for security purposes. In fact I was told by a leading Tamil politician that government had initially been ready to release much of this, but the secretary of Defence had changed his mind after the president suffered embarrassment at the hands of Tamil diaspora groups in Britain in 2010, apparently with support from the British government. It was wrong, however, not to continue with releases, and army personnel in the North seemed to agree with me, for instance when I pointed out areas continuing under control which obviously bulged out in a way that would have made them difficult to defend. All this was sad, because on the western and eastern shores in the Northern Province, the military gave back much of what it had initially wanted to keep. In my visits as the president’s adviser on Reconciliation – though in the last couple of years he ignored all my suggestions, I suspect because sycophants around him convinced him that I was no longer sympathetic – I found initially much anguish, which was later reduced when the forces returned much of the land they had claimed, and provided adequate compensation for the little they kept. But later there were efforts to resettle outsiders in areas in the Northern Province, and this caused much resentment, including among Muslims – though I should note that I was the only one to bring these matters up in Parliament, the opposition remaining silent and even a leading Muslim minister only commenting after I did. Is the current government of Sri Lanka seriously thinking of a political and peaceful solution of the Tamil question? They say they are, but there is little evidence of either thought or action. They have completely ignored the National Reconciliation Policy drafted in my office with the participation of leading politicians from both the UNP – which is the principal party of government – and the Tamil National Alliance, as well as the then government. Rajapaksa ignored it, claiming he had passed it on to his secretary, who claimed not to have received this, and when this happened twice I got the message. But President Chandrika Kumaratunga, who is supposed to spearhead reconciliation efforts, and does read English more readily, having said there were good ideas she would adopt in the policy she was preparing, has done nothing about this. Instead, as before, she seems to be working through elite groups engaging in cultural activities, while ignoring the bread and butter issues that concern people. Jehan Perera of Sri Lanka's National Peace Council responds to the UN Human Rights Council's report on the civil war.